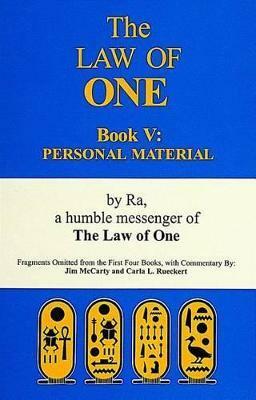 Book Five of The Law of One is comprised of the 56 fragments of personal material that were originally omitted from the first four books of this series. Both Jim, the scribe, and Carla, the instrument for the Ra contact, have added their comments to these fragments to give the reader an idea of what it was like to be part of this contact and to show how every person's experience can be used for personal growth and service to others. A wide variety of topics is covered, from Eisenhower's meeting with extraterrestrials in 1954 to UFO/government conspiracies, Wanderers, sexual energy transfers, anger, balancing, Aleister Crowley, the Tunguska crater in Russia, pre-incarnative choices, psychic greetings, alternate and orthodox healing modalities, the ball lightning phenomenon, and the many facets of the spiritual journey in general.